1. Put sliced peppers in double broiler insert and steam 10 minutes; add shredded carrots & peas. Steam 4 minutes; add zucchini and steam 2 minutes. Remove insert top broiler from boiling water and add tomatoes to vegetables and then spinach. Set aside with lid on top. Add salt & more water to boiling water and add uncooked pasta; cook according to package directions. Reserve ¼ cup of the salted water..
2. With the vegetables still in colander insert pan, pour the pasta into the colander insert and drain. Pour pasta & vegetables into pan. Add salt, pepper, pepper flakes, balsamic vinegar and ¼-cup jalapeno olive oil. Mix together. Add pasta water if still too dry .for your taste. Place on serving dishes and add shaved cheese, basil and sliced avocado. What to do with vegetables? I HAVE never thought of braising vegetables. I like my vegetables crunchy and therefore always stir-fry or roast them. The thought of slow-cooking vegetables for an hour or more was unimaginable. Perhaps it could work with potatoes, yams or carrots but surely anything else would just end up unappetisingly mushy, right? Needless to say, this month’s task posed a challenge for me. Despite reading numerous articles and recipes for braising vegetables I had many doubts. My curiosity, however, was piqued when I saw a recipe for vegetables braised in olive oil. The oil is flavoured with lemon, garlic, chilli flakes, sun-dried tomatoes (you can do this yourself by roasting halved cherry tomatoes under low heat – 120°C – for about an hour) and anchovies; I replaced the anchovies with Marmite to make the dish vegetarian. I deviated from the recipe by putting all my favourite vegetables into the braising pot – broccoli, cauliflower, brussel sprouts, mushrooms, potatoes and carrots. I expected the broccoli and cauliflower to end up mushy and discoloured but was pleasantly surprised to find them tender but still retaining their structure (and a little crunch too). Braising, I realise, is radically different from boiling. Braising uses gentle heat to coax out flavour (from the vegetables and the braising liquid). It’s genius! Will I try it again? Most definitely. Despite the length of time on the heat, the freshness of the vegetables is not compromised. They remain succulent and plump, and the flavours are bright and accented with the lemon and tomatoes that went in to season the oil. To top it all off, the aroma as the vegetables are braising is just intoxicating. In a cast-iron or heavy-bottomed pot, add the olive oil, chilli flakes, tomatoes, garlic, onion, rosemary, lemon and Marmite. Keep the heat on low to medium and allow the flavours of the ingredients to infuse into the oil. Once the garlic and lemon slices start to brown, add the potatoes and carrots into the oil and leave to cook, uncovered for about 7 minutes. Add the rest of the vegetables and stir to make sure they are all coated with the oil. They will only be partially submerged. Cover the pot and reduce the heat to low. Leave to braise for about 30 minutes without stirring, after which time the vegetables should have softened and browned somewhat. After 30 minutes, stir the vegetables to make sure those at the top get their chance to braise in the oil too. Keep the pot on low heat for another 15 minutes or so, stirring every now and then to make sure the vegetales are cooked evenly. Once you are satisfied with the tenderness of your vegetables, season with salt and pepper. Add the chopped parsley and remove the pot from the heat. Dish the vegetables and some of the seasoned braising oil onto a serving platter and shave some Parmesan over the top. 1. Grill chicken breasts set aside, approximately 10 minutes on each side over medium heat. 2. In a medium size saucepan add olive oil, sherry, garlic paste, onion, cherries and sweet chili sauce. Cook over medium heat until cherries and onion are tender about 15 minutes. Add dash of salt and pepper. 4. Serve over grilled chicken breasts. 1. In a large skillet, heat the Pompeian OlivExtra oil over medium heat, add the chili pepper and cook until dark. Remove with a slotted spoon and discard. Add the onions, zucchini, yellow squash and garlic and cook until the onion is soft but not browned. Add the Pompeian White Cooking Wine and reduce to 2 tablespoons. Add the thyme, oregano, paprika and turmeric and cook for 1 minute longer, stirring constantly. Add the tomatoes and cook for 10 minutes. 2. Fold in the chick peas and roasted pepper and mix well. Place the halibut cubes on top of the vegetables, season with salt and pepper and add the broth. Bring to a simmer and cook, partially covered, for 3 to 4 minutes or until the halibut is just opaque. Do not overcook. Taste and adjust the seasoning. 3. Immediately remove the pan from the heat and serve the “stew” in individual shallow serving bowls, garnished with a sprinkling of fresh parsley leaves. Serve with plenty of crusty peasant bread for “mopping up” the sauce. This pasta dish makes four smallish servings or three larger ones. You can supplement it with a tossed salad and ciabatta. Here we’re roasting eggplant and onions, then adding faster-cooking cherry tomatoes, to add to pasta. The amount of oil is approximate, depending on your taste. Also, other vegetables that would do nicely here, with similar cooking times: bell peppers, zucchini, broccoli florets and green beans. Heat a stockpot of salted water to a boil. Cook pasta according to package directions. Meanwhile, heat oven to 400 degrees. Line 1 large baking sheet with foil; brush a generous amount of olive oil over surface. (This will coat base of vegetables and also make them easy to remove.) Add eggplant and onion to cover about two-thirds of pan; it’s OK if they’re squished together; the vegetables will shrink while roasting. Drizzle additional olive oil over vegetables, then use a silicone brush to distribute over them. Put tomatoes in large serving bowl; add about 2 teaspoons olive oil. Stir to coat. Sprinkle 1-1/2 tablespoons Italian seasoning over vegetables on pan, and 1 teaspoon over the tomatoes. Sprinkle salt and pepper to taste on both vegetables and tomatoes. Bake eggplant and onions, 10 minutes. Remove pan from oven; stir ingredients and break up the onions a bit. Add cherry tomatoes to pan. Use brush to move tomatoes around to distribute oil and seasoning. Drizzle balsamic vinegar over all ingredients; use brush to distribute. Bake until fork pierces easily through the onion and eggplant, 10-15 minutes. Drain pasta; pour into large serving bowl. Stir in butter until it’s melted. Add roasted ingredients, including juices; stir. Scatter basil over top. Add cheese or pass for serving. To prepare artichokes wash well in water to which a squeeze of lemon juice has been added to avoid discolouration. Cut off small outer leaves and stalks. Turn artichokes upside down and gently beat with a tenderising mallet until the leaves open up slightly. To prepare the filling place the breadcrumbs, duly squeezed to remove the vinegar, and add to it the finely chopped garlic, parsley, anchovy fillets and black olives. Season, add Extra Virgin Olive Oil and mix till moist and soft. Put this filling into the centre of each artichoke and stuff among some of the leaves, until it is all used up. Place the artichokes upright in a saucepan, add 8cm of water and drizzle of olive oil. Place a tight-fitting lid on the saucepan and simmer gently till artichokes are tender (an outer leaf should pull out easily). Serve with some good virgin olive oil and salt dipping the leaves in this and bite off the tender part of the leaf. When you reach the heart discard the choke and mash the heart and eat with more oil and maybe a juicy red Maltese tomato and some Maltese bread. With grilling season in full swing, here’s a quick 5-ingredient recipe that’s full of flavor, and summer veggies and makes a great one-dish meal. Add slices of grilled chicken or crumbled goat cheese or feta to make a heartier plate. Serves 4. Enjoy! ¼ cup loosely packed fresh basil leaves, finely sliced. Remove the tops and stems from the bell peppers and clean out any seeds from the inside. Cut in half, removing any white parts, and then cut each half in half again. Set aside. Trim the ends from the squash and then cut in half lengthwise. If very thick, cut in quarters. Trim and peel the onion leaving the root end intact to hold the slices together. Cut in half, and then cut each half in quarters. Brush or drizzle all of the veggies with your favorite Extra Virgin Olive Oil* and season with salt and pepper.Grill vegetables for about 10 minutes, turning once until tender and slightly charred. Meanwhile, cook couscous according to package directions. Drain couscous and toss with your favorite Extra Virgin Olive Oil*, half of the sliced basil, salt and pepper. Cut peppers and squash into smaller pieces. Divide couscous among 4 plates and top with grilled veggies. Finish each plate with a drizzle of olive oil and more sliced basil. To prepare the marinade, combine the Extra Virgin Olive Oil, Balsamic Vinegar, garlic and herbs in a bowl. Whisk until blended; add salt and pepper to taste. Place the 2 pork tenderloins in a large sealable plastic bag. Pour in half the marinade and refrigerate for 1 hour or overnight, turning the bag occasionally. Pour the remaining marinade over the peppers, onions and eggplant and toss. Arrange the vegetables in a large oiled roasting pan. Roast in the preheated oven for 15 minutes. In the meantime, heat a large non-stick skillet over medium-high heat. Remove the pork from the marinade. Add to the skillet and brown on all sides. Transfer the pork to the pan of roasted vegetables. Return to the oven for 20 – 25 minutes or until the pork registers 155 degrees on a meat thermometer. Slice the pork and serve with the roasted vegetables. 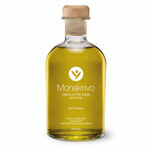 Drizzle Extra Virgin Olive Oil over finished dish. Cut the meat into cubes and sauté in very hot oil with the finely chopped onion and garlic. Add the pepper and carrot. After another 2 minutes, add I cup of water and as soon as it boils remove the scum that forms with a slotted spoon. Leave the meat to simmer for about 1 hour. When it is half cooked, add the chopped tomatoes and seasonings. Add the hylopites and continue to cook for about another 20 minutes until the red sauce has thickened, the hylopites are cooked and the meat is tender. Serve hot, sprinkled with the grated cheese. Coat the chicken with the mixture and marinate for 24 hours. Cook the chicken with the marinade at 325 until done. Heat 2 tablespoons of the Vaoni extra virgin olive oil in a large sauté pan over medium heat. Add the garlic, shallots, thyme, bird’s eye chilies, and the Anaheim chiles, and sauté until the shallots are translucent, about 2 minutes. Add the coriander seeds, cumin, and caraway seeds, and sauté for another 2 minutes. Transfer to a blender with lime juice, salt, and the remaining 6 tablespoons Pompeian Picholine extra virgin olive oil, and puree until smooth. You could barbecue fresh peppers for the salad, but I’ve chosen to keep things quick and easy, and used jarred. Mix together the olive oil, paprika, thyme and half the garlic into a bowl. Stir in the cubed pork. Cover and set aside to marinate for 15 minutes. Thread the pork on to metal skewers with a couple of bay leaves on each skewer. Preheat a barbecue to hot. Cook the kebabs for 8 to 10 minutes, turning until browned all over. Combine the soured cream and remaining garlic in a small bowl and season with sea salt. Set aside. Combine all the ingredients for the salad and season with salt and freshly ground black pepper. Set aside. Serve the skewers with the salad, garlic soured cream, warmed flatbread and lemon wedges, if you like.